It’s finally starting to genuinely feel like spring here in Colorado and that means it’s time for our crochet projects to switch gears a little bit. Lace, plant fibers, and bright colors are the name of the game for spring crochet, as we prepare for still warmer months to come. Things are changing on Pinterest too, as they do every season. Here are some pins from our Pinterest account, Crochet Me that have risen to the top as crocheters like you have been seeking out inspiration for their spring projects! Enjoy, and don’t forget to follow us on Pinterest to always have a finger on the pulse for what’s new, trendy, and fun from Interweave Crochet, Love of Crochet, and more. 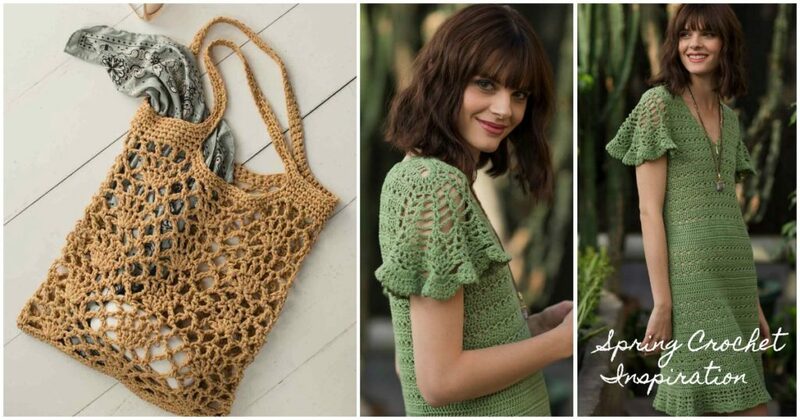 Which one of these spring crochet patterns is calling your name? Start something light and lacy for yourself today! Originally published April 2017, updated April 2019. Header Image: Light of Day Tote by Donna Childs. Jade Dress by Natasha Robarge. Photos by Harper Point Photography.